BOOK ONLINE AND GET 2 X 1 for every adult booking. To validate the promotion is only necessary to enter an adult, once your purchase is completed please contact us for registration of the second person. valid Promotion dinners Court New York, do not apply other promotions and not apply dinners with transportation, in addition, each person must pay the Surcharge ($ 14.00 US per adult), ($ 5.00 US under 6 to 12 years) . This offer only not applies on the following Dinners: Surf & Turf y Lobster. Come and live a fantastic adventure aboard the Galeon I and Bucanero II, two 17th century authentic Spanish Galleon replicas that thanks Captain Hook you will enjoy with an entire night of games, exquisite food and an extraordinary pirate show. These spectacular galleons have 93 ft in length and can hold up to 350 passengers, where you will experience a real pirate environs but with the luxury and sophistication of the 21st century technology. Once aboard our pirates will welcome you with a delicious cocktail while the sound of cannons will announce the departure. From that moment all the fun will start with a lot of games, contests and dance activities as well as a fascinating and colorful pirates’ relates. At dinner time this incredible attraction offers you the possibility of trying a delicious dinner buffet style and the choice of an exclusive steak dinner with finest prime cuts or succulent lobster. Our buffet includes salads, vegetables, Marinera rice, Grilled chicken, baked potatoes, desserts and domestic open bar. Coming back you will enjoy the best music at the disco, games, contest and you’ll wish the night never ends. 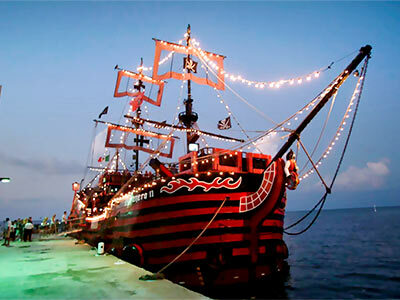 Dare to live this fun pirate night on board these two authentic Spanish Galleons in Cancun.